Rob and I decided to hug the northern coast of the Dominican Republic, stopping in villages and towns for rest at night. Outside of Punta Cana, we experienced the worst roads and it’s generally the least digitally mapped area, so our route was a bit different. From Sabana De La Mar, we took a boat to Samana, and hugged route 5. Unfortunately Google only lets us show going around Parque Nacional Los Haitises then taking route 7. There were some other stop-offs, like Playa Grande and waterfalls, that aren’t shown plus the roads are under construction, so the routes are likely to change. In Haiti, we even came across parts where the road had been entirely engulfed by a nearby river. 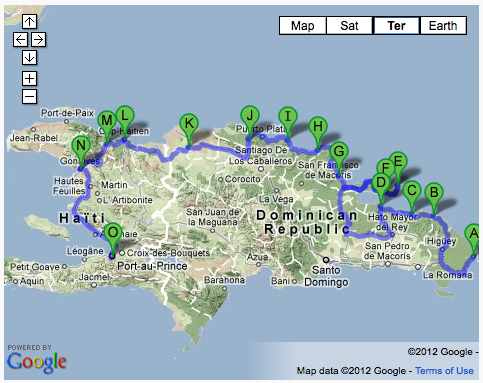 But this is a close estimate and a route we’d definitely recommend checking out. Each day, the terrain is different, the atmosphere and scenery changes and the spirit of the cities show their unique colors. Thanks to everyone who followed along on this journey and happy new year. 2012 will be a great one!